With the release of Opera Mini 5, the Opera Mini Forums have been flooded with newbies complaining that they can’t find the signed versions of Opera Mini or even that Opera has “screwed them” them by not allowing them to download it their un-supported phone. Visit mini.opera.com using your phone browser, You will see a screen similar to the two below. If Opera recognizes your phone it will display the make and model and offer a version that it has verified as working on the phone. It may not be the latest version, many devices that Opera recommends 4.2 for can actually run 5.0. The default download may or may not be signed and there is no indication whether it is or is not. The default is designed to make things easy for non technical users. If you are a power user click the “Other download options” link to get the long list of available downloads shown on the right or at the top of this post. See the “Select Code Signing Certificate” links at the very bottom? Unless you are using a BlackBerry (which doesn’t need certificates) or a Windows Mobile or Android device (the downloads for these are always signed), you will want to click one of the Code-Signing option links which will take you to the screen shown below. Using a signed version, if your phone supports it, generally lets you turn off some or all of those annoying security prompts that you get accessing the internet, saving pages or downloading when you use an unsigned version. So how do you get the right signed version? If Opera detects your device there is a good chance the default download link on the first screen at mini.opera.com will give you a working signed version. If you have an un-tested phone or the default version turns out to be unsigned or doesn’t work for any reason, try downloading one of the other versions. I’d start with the “All Certificates” one followed by the “Verisign”, “Thawte and “no certificates” versions, in that order until you find one that works. So what if you want to download a signed version of Opera Mini to your PC for sideloading? The PC downloads at http://www.opera.com/mobile/download/ are all unsigned and if you go to mini.opera.com with a PC browser you will get redirected to the PC page. The trick is to make your PC browser impersonate a phone. This is easiest with Firefox, follow this link to install the User Agent Switcher Extension. Then switch the User Agent to either the Googlebot or iPhone ones, or better yet add your own phone’s user agent (visit ua.yeswap.com with the phone’s browser to find it) to the User Agent switcher. 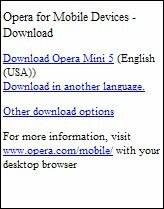 Now when you visit mini.opera.com you will see the mobile page and be able to download any version you want. Downloading to a PC only gets you a .jad file however. It’s a text file that contains the signature and other information that tells the phone where to download the .jar file, which is the actual executable. To get the jar file open the jad in a text editor. Don’t use Windows NotePad as it runs all the lines in the jad file together making the next step harder, WordPad works as do any of the many free editors like NoteTab Lite or Notepad++. Once you open the jad file look for a line beginning with “MIDlet-Jar-URL:”. The rest of that line, everything after the “MIDlet-Jar-URL:” is the jar file download URL. Paste it into the Firefox URL bar, hit enter and the jar file will download. This entry was posted in Browsers and tagged code signing, Opera Mini, sideloading by Dennis Bournique. Bookmark the permalink. I think the Opera Mini 8 English (International) signed version link installs the English (USA) version. When I install the unsigned version of English (International) I am able to view non English characters, but when I install the signed version I see boxes for non English characters. Any Ideas how to get the signed English (International) version? I have the Chrome Browser. how can i download operamini in samsung chat e222 phone. i twice download opera and deleted it as tried to download it again i could’nt, and it always displays invalid and authentication failed, so how can i fix it? I don’t think it’s possible to download apps to the Samsung Chat over the air. You need to download them to a PC and transfer them to the phone using Samsung PC Studio. It’s also possible to impersonate a phone with the “ua” url parameter, e.g. Works exactly the same as a UA header, as far as I tried. thank you, i needed to download opera mini to my pc, so that i could modify it to get rid of my phones navigation buttons(so i could use the touchscreen and operas built in keypad) having the signed version helps so it doesn’t ask for permission as much. Perhaps your phone doesn’t support signed apps, try the unsigned version. 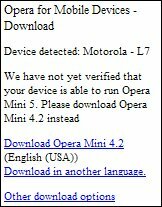 How can i download opera mini 4.4. Please give me the link for download this. Why i can’t download saying certifcate not on phone and i created nokia account but also i can’t download. Try all three signed versions. 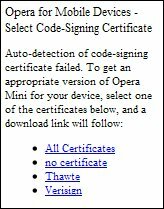 If none of them works your phone doesn’t support the signatures Opera is using and you will have to use the unsigned version. I can’t see facebook comment box in my nokia 2630 whats the problem? Please help me.